Heat will naturally rise, and as much as 25% of your home’s heat will escape through the loft and roof. This means adequate roof insulation is crucial to reducing your energy bills and cutting carbon dioxide emissions. Roof insulation will last for 40 years and with payback in as little as two years, it’s an extremely worthwhile investment and cost-effective way to reduce bills. It doesn’t matter if your roof is uninsulated, or just requires a top-up. You’ll save money either way and help yourself to escape fuel poverty fears. You’ll be able to install pitched roof insulation, flat roof insulation and even conservatory roof insulation. How much will I save with roof insulation? With the rising prices of gas and electricity affecting most homes, finding a way to cut your expenses is very important. Roof insulation is a great way of doing just that, and is installed with minimal hassle and little cost. 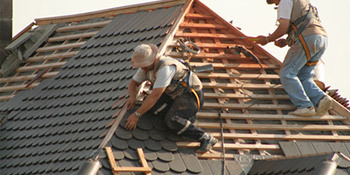 270mm is the recommended width of roof insulation, according to the Energy Saving Trust. Whether you have no previous insulation or are simply topping up, this is the desired width. With these savings over 40 years, you’ll make a huge saving that’ll benefit both your finances and home’s environmental friendliness. It’s not just the roof lagging that will provide insulation and once this is installed, the area above will be noticeably cooler. This could cause the pipes and water tank to freeze in the winter, if not suitably insulated. This wouldn’t cost too much and you can expect to save a little money on your heating. It would also be worthwhile insulating the loft hatch with a draught excluder too, to stop cool heat escaping through the cracks. Roof insulation is a great way to reduce your bills as most heat loss in your home is through the roof. Lagging helps to retain heat, cutting bills by up to £175 a year. If you’re interested in reducing your expenses and boosting your finances, complete our quick form and receive up to four FREE roof insulation quotes from vetted and reputable installers. The Eco Roof and Wall Company Ltd.
Finding a company I would otherwise not have known about. only 1 quote received promised 4 why??? I had no connection with companies that carried out this work so it was helpful to have a line in to people whom relied on feedback to get their work.